As featured in The Yoga Minibook for Weight Loss the 2-part Podcast Series offers a complete yoga weight management and lifestyle program. Extras including Elaine's Yoga Diet Plan, Yoga Weight Loss Recipes, Yoga Abs &Core Videos, Natural Weight Loss Supplements. This new, expanded PDF edition features bonus extras like Elaine’s yoga video tutorials and her latest articles on yoga weight loss research. 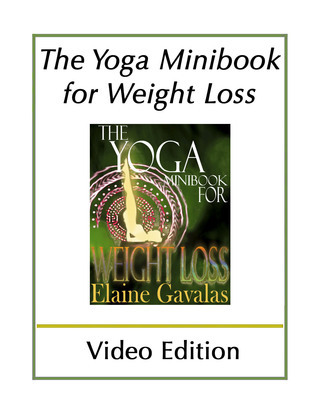 The New, Expanded Video Edition of THE YOGA MINIBOOK FOR WEIGHT LOSS contains 59 links to video tutorials featuring yoga therapist Elaine Gavalas. 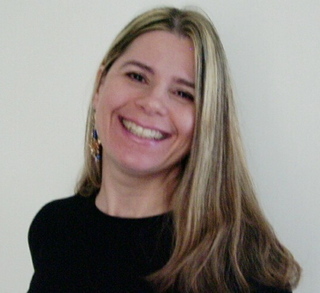 This much anticipated edition includes updated bonus extras like Elaine's Yoga Weight Loss Diet Plan and Recipes and her latest articles on yoga weight loss research. 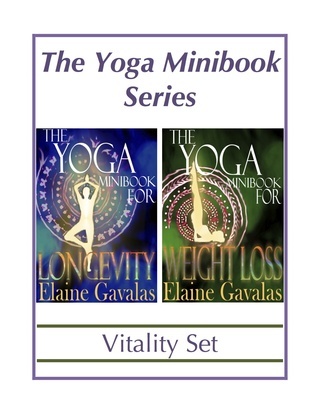 THE YOGA MINIBOOK SERIES VITALITY SET features the new, expanded editions of THE YOGA MINIBOOK FOR WEIGHT LOSS and THE YOGA MINIBOOK FOR LONGEVITY. 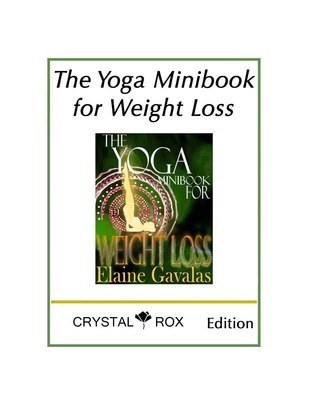 Jumpstart Your Weight Loss Resolutions with THE YOGA MINIBOOK FOR WEIGHT LOSS. First in the Yoga Minibook series, THE YOGA MINIBOOK FOR WEIGHT LOSS offers a complete guide to yoga diet and exercise for permanent weight loss and weight management. 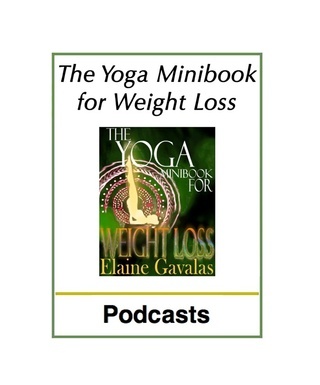 The new, expanded ebook edition of THE YOGA MINIBOOK FOR WEIGHT LOSS contains bonus extras including Elaine's Yoga Weight Loss Diet Plan and Yoga Weight Loss Recipes. In seven concise chapters full of illustrations, readers learn poses to increase cardiovascular fitness, burn calories, strengthen and tone specific body parts, with the final chapter dedicated to choosing a healthy diet. The Yoga Minibook Series was written as self-help guides in response to people's many fitness, diet and wellness problems, questions and concerns. Elaine's Ebook cookbooks, YOGI IN THE KITCHEN and SECRETS OF FAT-FREE GREEK COOKING are companions to THE YOGA MINIBOOK FOR WEIGHT LOSS. Featuring the world's healthiest and most delicious diets and cuisines, Elaine's healthy cookbooks help you achieve and maintain your desired weight goals, make your best food choices, and enjoy a lifetime of nutritious eating and good health. This is a great book, yoga basics are laid out in a simple, understandable format. In most other yoga books, they have taken up a lot of pages explaining yoga philosophy and diet plans, not sowith this one. For such a little book it includes a LOT of workouts. Definitely worth it, a great buy!" "Useful little book from Amazon.com. The organization of information is good; the directions and illustrations are clear. There is a good explantation of purpose of exercises." Great book to take along on trips. Easy to follow - good poses. Would hightly recommend it."